SALT LAKE CITY — With 90 seconds remaining in regulation of his first playoff game, Copper Hills guard Preston Sanchez calmly stepped to the free-throw line with his right eye blackened. The sophomore guard effortlessly sank two freebies to extend his team’s lead to four. Moments later, he repeated the act twice more to preserve the Grizzlies’ 55-47 first-round win over Hunter in the 5A basketball tournament at the Huntsman Center on Tuesday afternoon. Hunter, which entered the postseason as the No. 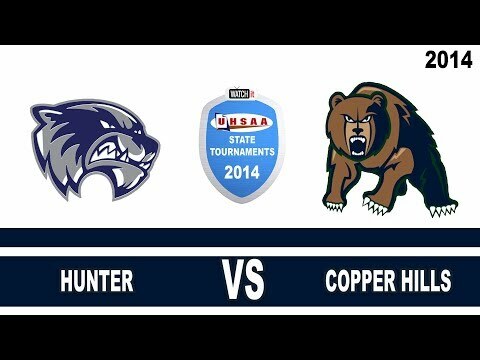 2 seed from Region 2 despite finishing below .500, tried to tempt Copper Hills into making youthful mistakes. But each time the sophomore-laden Grizzlies responded with resolve typically unassociated with inexperience. The Wolverines were led by Noah Togiai, who at times single-handily prevented Copper Hills from putting the game out of reach. The University of Utah commit scored 21 points along with nine rebounds, four assists and two steals. With 4:20 remaining until halftime — after the first quarter was marred by sporadic execution — Copper Hills grabbed a 22-13 lead on a layup by Porter Hawkins, another sophomore who notched a double-double with 14 points and 10 rebounds. At the beginning of the fourth quarter, after Togiai swished a mid-range buzzer-beater to end the third, Charlie Olsen pocketed a 3-pointer before Sanchez chipped in an easy layup to inflate the lead back to seven, 43-36. Togiai initiated another burst shortly thereafter, while Copper Hills appeared to tighten and uncharacteristically switched to the four-corners prevent defense. Eventually, Togiai connected on a straightaway 3 to pull the Wolverines to within two at 47-45 before Sanchez delivered at the line. Copper Hills advances to the 5A quarterfinals on Thursday with the win, where it will face Davis. “They’re one of the best teams in the state for a reason,” Blanchard said of the Darts. “They’ve got some exceptional guards that can play and shoot. We have nothing to lose. We’re going to go out there and play as hard as we can and the pressure is going to be on them."